I'm a fan of Warner's work. He makes Buddhism accessible and places it in a modern context, keeping it fun and interesting the entire time, while not seeming to water it down or make it something it is not. This work was no exception. 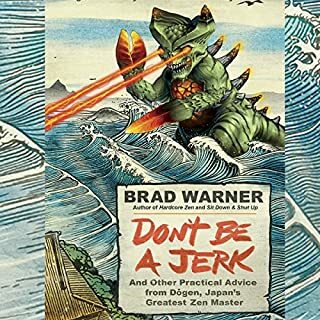 I'm fairly certain that his paraphrasing of Dogen was intended for someone just like me and hearing him actually read some of the more amusing parts of the book had me laughing more than a few times, very enjoyable. The drawback to the audiobook was that it referenced a lot of other material and I don't find audiobooks as a good way to go back and follow up on things like this. One might be better served by having a paper or ebook edition available for references. I know that is what I did.